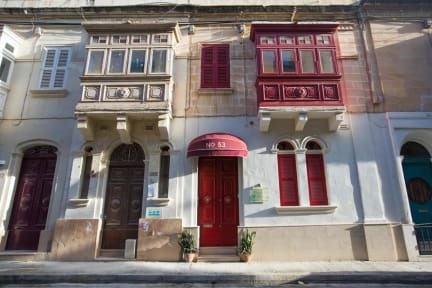 Granny's Inn is a family run hostel which is ideal for travellers who wish to have a comfortable stay when visiting Malta for both a short or long period. It is situated at 10.7km away from the airport and five minutes(300 meters) walk from the beach. It is very important that when booking your accommodation, you insert your flight number and arrival/landing time in order for us to instruct you how to check-in. When arriving after 14:30, we will need to agree beforehand on your check-in instructions. We can also organise your airport pickup in order to have an easy arrival! Just e-mail us your flight details. * Sliema Waterfront - Malta's top tourist area where one can find a nice promenade together with bars, restaurants and shopping malls. * Paceville is Malta's famous night spot: for clubs and nightlife. One can also find shopping malls, bars and restaurants. * Bus stations: Easy walking distance to main bus routes. Also close to the Sliema Ferry which goes to Valletta. * Beaches: A long stretch of seafront where you can soak up the sun and refresh yourself in the cooling waters is just down the road. Reception available 08:30 - 14:30(can be called for assistance the remaining time). On the third floor, one can relax on a spacious sofa in the TV room which includes an LCD TV with premium channels(sports & movies). Granny's Inn is able to cater for guests staying in single, double or dorm rooms, all non-smoking. The dorms, one of which with a balcony, are all furnished with bunk beds. Guests are all given a front door key. More like being at home, really. Amazing atmosphere and very pleasant staff. I can't recommend it highly enough! Granny's inn is a really cool place! I stayed in 6-beds dorm which also has another tiny room with a fridge, a desk, two chairs, a sink and a mirror. You have all you need for cooking in the kitchen and in the evenings we often had dinner together with other guys, it was really nice. There is a cosy small living room on the second floor, a balcony with a table and two chairs and also a rooftop terrace. Also want to thank the girls who keep this place superclean!!! A really lovely hostel, that gives more of a homely feeling than any other hostel I have ever been. The service they give its defenitly up to par with the price you pay or more. You will find all kind of people, from foreigners working in malta to improve their english, to people just visiting the island. It has a lovely stuff, always ready to help, interacting with the guests, and sometimes showing you some part of the Island. If I ever went back to Malta I wouldn't doubt to go back. I stayed at the hostel 5 nights in February and enjoyed it. Good atmosphere. Some longer term residents, which allows for making connections if you're staying longer term, and short term guests. Rooftop which I didn't use. No heaters in rooms but many blankets to keep warm in winter. Living room on 3rd floor. Well equipped Kitchen (main hanging out spot) on 1st floor. Hot water. Overall place is clean enough. Sheets, bedrooms and kitchen are really clean and neat. Even though it is a old building inside was renovated but you can still get historical vibes because of the designe. Breakfast is not really reach but it is okay. Neighborhood looks safe and quiet. Nice hostel. The atmosphere was really chill. Not too much going on, everyone was only focused on their stuff. Didn’t have any trouble at the hostel, everything worked perfectly. The kitchen has everything. I recommend it. The hostel is well located and is really easy to reach from the airport by a shuttle service. 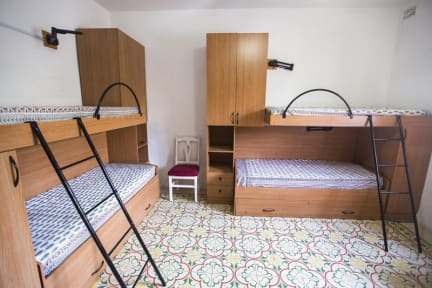 During my stay I did not meet anyone formally from management, so I'd say if you're looking for advice on places to visit and how to get there this isn't the best hostel. I booked a female only dorm, yet men still came into the room which I have never seen. The atmosphere is not great in the hostel, the staff are clicky and speak in French.